Right in the heart of the Las Vegas Strip, the Carnaval-themed Harrah's offers an endless variety of entertainment options. Entertainment is always a highlight at Harrahs with the Tenors of Rock. Afternoon comedy is in hand at the Mac King Show with two afternoon shows five days a week. King's unique act combines quirky humor, visual gags and sleight-of-hand. Menopaise the Musical along with X Country and the Righteous Brothers featuring Bill medley and Bucky Heard. The music never ends at Harrah's, with the Dueling Piano Twins playing nightly in the new Piano Bar, and live entertainment throughout the hotel. There's never a shortage of award-winning restaurants either with culinary hot spots including Ruth's Chris Steak House, The Oyster Bar, and of course, Toby Keith's "I Love this Bar & Grill!" 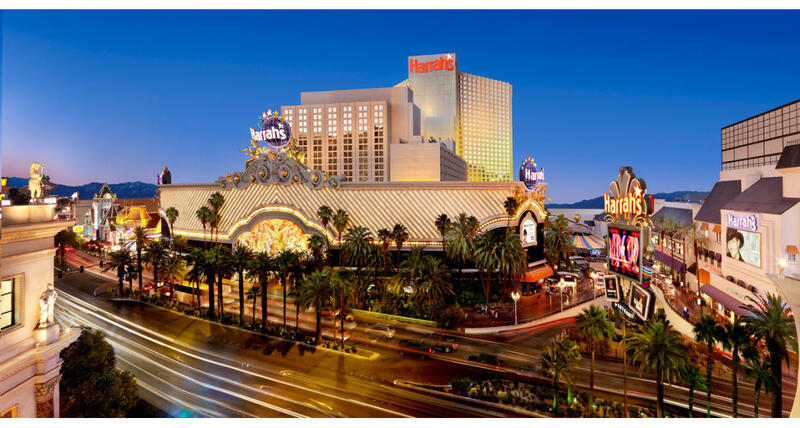 Harrah's three hotel towers offer over 2,500 rooms,almost 200 luxury suites, with a full range of services: a full-service spa, health club, beauty salon, swimming pool with cabanas, and a variety of retail outlets. The large casino consists of over 80 table games, over 1,200 slot machines and a poker room.The Sports Pit featuring high definition screens, continuous betting action and a full service bar and deli, is great for sporting events all year round. When the last game is over, the venue becomes a sports themed lounge continuing the fun into the night.